Ganesh Chaturti is definitely one of my favorite festivals (as indicated in my previous post). With eco-friendliness being the latest rage, and with us opting for an eco idol, I did have a plan springing up my sleeve. Sculpt an idol myself :). There were times when I would make these little idols out of Wheat flour, my mom used to make different delicacies. It always was a thought I had in the backburn for a long time. So with the idea discussed back home- the first task was to get some clay. Shaadoo mud (the mud that can bind easily and stay put post drying), everyone we asked did not have that available, so one fine day made a run down to Staples and spotted some paper clay in the children's section. There were various brands and varieties, finally picked myself one of the more sophisticated looking (no BS types) package. It was a heavy pack with grey paper-clay. Decided to sculpt the idol the next day on Friday, since 'was pretty tired post office. The next day started with me getting my hands dirty at ~8:30am. 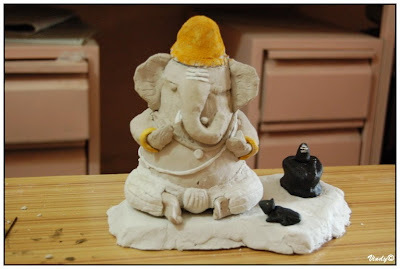 Tried various techniques but the minimal quantity of clay made this a daunting task- the idol would not be big enough. That's when an idea clicked in mold the clay around something round to create the body and then something simillar for the head. It worked! Used a glass bowl for the body and stuffed the void with a lot of wet paper, then elongated the body upwards using some card paper- stuffed it further with a lot of paper. Finally used one half of a plastic ball to create the head. Now I had the basic structure ready all covered with clay. 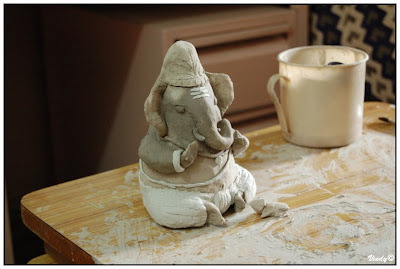 It did start looking like a promising Ganapati in the making :). A few more hours and the crown, trunk and hands and legs were ready. The idol unfortunately did not have a neck ... so it looked like an elephant in a seated position. Looked nice. With this ready, left the idol for drying and pushed off to work. Bought another pack of white paper clay since, I could sense the need for it quiet easily. Back home, just created a simple mouse for the idol and it surprisingly turned out too cute. The idol was still wet, so left the fan on the whole night. Next day, further dried the idol in the microwave (1 minute each rotation for ~5 times, since there was glass and plastic inside of it :D). Used the clay to further fatten the arms and legs. By now the idol truly started to represent Lord Ganesha. Picked a couple of slate stones lying around in the rubble. Used them to create the base seat. Covered the same with clay. Now used the scissors to carve in some dhoti textures and other little features around the idol. After this used some extra clay to make the ornaments and sculpt a shivaling. Placed all of these on the platform and it looked too cool in grey and white :). Now came the big challenge- coloring the idol. Everyone agreed that it looked good in its natural grey form, but I wanted to color it and that to in eco-friendly colors. So used kajal for black and it worked wonders for the mouse and shivaling. Tried haldi for yellow/gold but it looked too dull. Finally decided to go off eco and get myself some true colors from the market. In the evening, we went to get our shadoo ganapti and also purchased some decorations. Back home post my dental appointment, raced off to get some acrylic colors and brushes. Red, Blue, Pink, White, Black, Gold, Brass-Gold were the base colors. The painting session went all the way till ~10:30 at night, and all had a blast sitting around pouring in their suggestions. All of this with the decorations and preparations for the festival the next day. The idol was ready with a grey body and gold with vaious colors seated on grass :). It was that time of the year again. Festivities aloom and the usual gaga gogoo on the streets raging in all blast and vigor. But no! NO no ... doubly no! Not this year.. it was all mellowed down. The city was gripped in one tough situation with the epidemic on the loose... that had all Puneiets behind closed doors, all shopkeepers had their shutters down, the city administration was planning on a total shutdown of the city (City under quarantine!). It was unbelievable, in a matter of a couple of weeks and some blaring media reports the city civic officials were forced to pull up the red flag. Swine Flu had the whole city in its grip. But it was the "Shravan mahina" and this the season of festivals... lakshmi pooja, gokulashtami, ganesh chaturti etc. etc. Ganesh Chaturti! - the festival that had me and still keeps me smiling on its advent. But this time around, the influenza scare had all the hulla gulla mellowed down. 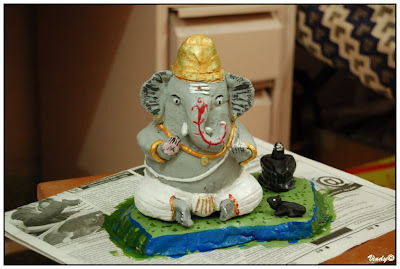 We planned on buying on buying an Eco-friendly Ganesha idol this time around. Wify and me did some research and finally got to know from Rahul that we could purchase very good "Shadoo Ganapatis"(Ganapati idols made from mud) from near Rastapeth. We decided on visiting the place a week before the festival and place an order for the same, if we like an idol. The shop was small, but was full of idols. It had both POP(Plaster of Paris) and "shaadoo" idols. The owner directed us inside the shop to a room where he had numerous idols of various shapes and sizes, most of which were made of "shaadoo". Rahul and both of us instantly liked one of the Ganashea's with a Tanaji turban (It was called "Jai Malhaar"). But it was too big so we decided on looking at other smaller idols... These idols looked really wonderful, but most of them were booked. A couple of idols which we liked were gone too. 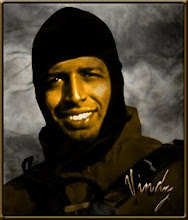 After some hunting, both of us zeroed in on an idol that was not brightly colored - but had a uniform brownish color. It looked beautiful. We decided to do more research before finalizing on one. Back at Rahul's house for the second hunt round, this time around we paraded various shops in the Rastapeth area with Rahul's mom. None of the shops had very attractive idols. After much hunting we returned back to our Shop no.1. 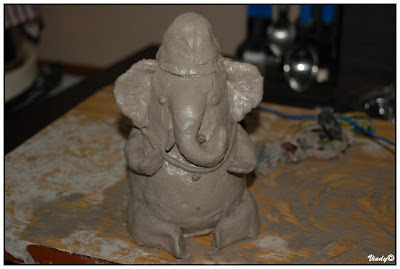 In 10 minutes we had ourselves booked the uniformly brownish painted Ganesha idol. We both loved it- it was pleasing and had a wonderful presence. Like Rahul's mom said "You guyz already had your eyes on this one... so none of the rest appealed to you". But these words were going to recoil back , as Rahul was very insistent on getting the "Jai Malhaar" idol. The next ~1.5 hrs were spent scanning each and every idol in the shop. Every idol looked beautiful, all the brownish idols appealed to me ;). Every time we selected an idol, there would be some doubts and we would again consider the "Jai Malahar". It was tiring, but a lot of fun! The basic issue was the size and the turban on the idol :). Eventually after a lot of head hunting and help from the shopkeeper Rahul booked his "Jai Malhaar"! It was an all successful shopping spree... all owners were returning back happy. Took some pics and showed our folks back home... they liked our choice... (It was right sized and did not have the turban ..hahaa ). We would be getting our idol a day before the festival... so 'am really looking forward to this year’s Eco friendly H1N1 mellowed down festival!